The Plum’s astoundingly tasty fried chicken sandwich ($8). As you survey the happy hour landscape of Cleveland, you'll find a lot of things that look and sound the same. A burger special, for instance. Or tacos. Always tacos. Probably some wings. Likely a flatbread. The same beer for the same price that you can score next door, down the street, and on the other side of town. Everyone loves all those things, or at least some of those things, and we love all the places that dish up all of those things. But we also love some things that are just a little different. That's all by way of saying these happy hour specials didn't fit into previous categories but still deserve your attention. This Lakewood geek haven is just about the most welcoming, fun bar in town. After all, what's better than plopping down with some pals around a favorite, or new, boardgame. Side Quest has some 300 of them, and during happy hour from 4 to 7 p.m. Monday through Saturday, games are free. Yes, free. They also offer $1 off drafts and a roll of a D12 die for a chance at a mystery $4 draft. When you're in need of a simple, quick one-two punch of a beer and a slice of pizza, XYZ is there for you. During happy hour from 4 to 7 p.m. Monday through Friday, the Detroit-Shoreway neighborhood tavern makes it easy and cheap, with a beer and a slice special for just $5. In a neighborhood that runs on red sauce, it's shocking to find an Italian restaurant in Little Italy that lacks a single marinara. And yet that's exactly what's on the menu — or not on the menu — at Nora, where chef Eddie Zalar applies his classic French training to characteristically Italian ingredients to come up with dishes that are in synch with the season. Drop by one of Cleveland's best restaurants from 5 to 7 p.m. Sunday, Tuesday, Wednesday or Thursday, eat at the bar, and snag 20 percent off your final tab. If you've never dropped by this izakaya-inspired bar and restaurant, do correct your mistake as soon as possible. Energetic, fun, irreverent, and a total blast, Yuzu dishes up Asian fusion fare without pretense. On Thursdays, grab a $5 ramen special (yeah, it's not technically only at happy hour, but who cares) from a roster including veg, carnivore and gluten-free options. "Keep it simple" is a mantra that is valued but often ignored. Not at Ginko, the 7-year-old Tremont eatery that has a monastic focus on raw fish. Here, almost all of the admittedly small subterranean space is dedicated to the sushi bar, where obsessively fresh fish is draped over lumps of steamed rice. Diehard sushi fanatics travel distances long and short to belly up to this bar for the city's best tuna, yellowtail, uni, mackerel, eel and octopus, all of which is served up in a boldly designed setting. Enjoy that unique atmosphere and top-notch fish at happy hour when select rolls are $5 and Sapporo is on special. By now you're probably familiar with the origins and mission of Edwins, Brandon Chrostowski's Parisian bistro and training facility at Shaker Square that helps ex-cons learn, work and advance in the culinary field. And by now you also probably know that the execution matches the mission here, where the food shines and the service is impeccable. 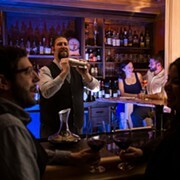 Happy hour (Monday through Saturday, 4 to 6:30 p.m.) at a fine French bistro? Absolutely. Escargots de Bourgogne (Burgundy snails with fennel, garlic and butter) run just $7, truffled cauliflower gratin $8, Kroenenbourg 1664 $4, and so on. Where the damn snacks at? 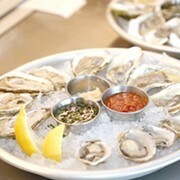 Happy hour beverages, we should know by now, are best enjoyed with something salty and delicious. Bar nuts are called bar nuts for a reason. Sometimes we don't want a giant burger or a pound of fries. Sometimes — almost always, in fact ­— we just want something small to nibble on whilst we sip on a brew or two. Bless Deagan's for recognizing that. 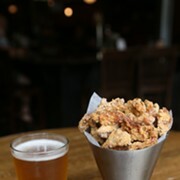 Happy hour (Tuesday through Friday from 4 to 7 p.m.) means discounted drinks at this Lakewood favorite, but it also means nuts with brown sugar, rosemary and cayenne ($3.50), buttermilk fried chicken skins ($3), and spicy olives ($2.50). There are the damn snacks. Happy hour might be called "snack time" at the Plum, and there is a snack available (Ma's Pastelillos, filled with beef and potato, for $3). 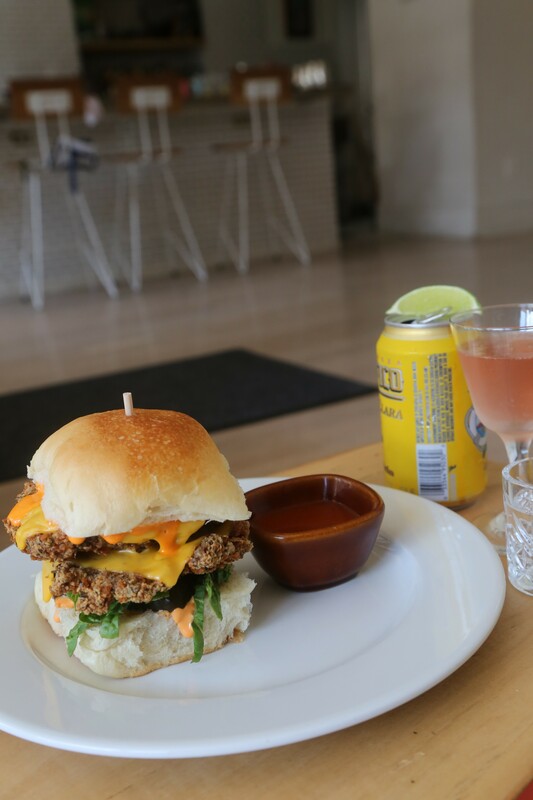 But you'd be remiss to skip the mammoth fried chicken sandwich ($8) during happy hour from 4 to 6 p.m. at the bar. Juicy, crispy, spicy (if requested), the stomach-buster is a meal unto itself. Pair with a Pacifico and shot of El Jimador ($5 total) and ease into the evening in nirvana.